Biz Stone let the world know that Twitter’s SMS service is no longer active in Africa – or anywhere outside of the US, Canada and India. To most people in Africa this means absolutely nothing, as the penetration rate for the service never moved beyond the few fringe users amongst the technology elite. I’m guessing that at least half of this blog’s readers are wondering why they should even care about this news. After all, it sounds like some new trendy mobile/web app has failed to expand outside of North America – how is that news for Africa? Two examples come to mind, specifically addressing humanitarian uses; first, there’s the case of it being used in Egypt to help a jailed user, and second was when Juliana used it during the Kenyan post-election violence to update about events in Western Kenya in lieu of a blog post. Soyapi wrote a post a couple months back talking about the potential for Twitter in Africa. In areas like Africa where mobile phone penetration far outstrips internet penetration, Twitter ends up being an incredibly good way to update friends, family – or in the case of businesses and government, the general public – about things that are happening. This global contraction by Twitter creates opportunities for others. Jaiku, recently purchased by Google, now has the ability to grow deeper into other regional markets. And, if nothing else, Twitter has done us all a favor by launching a global pilot project that proves out the usefulness of this type of service. Launching country- or region-specific clones of this same type of service is now a real option. The story of Chinese blogger and activist Zuola, who just today tweeted his own detention, should show how powerful Twitter can be. Because you can see that Buck’s case was not unique – but rather a typical situation in which Twitter can be used for more than entertainment. 1- Are people ready to pay all the SMS they will send? 2- How to make them pay? The answers would change the philosophy of a twitter-like, because when you pay, the “followers” are the people you want, not the people who decide to. Assumedly this is primarily a financial decision – in addition to just scaling and providers. I agree that the objective should be to have Twitter-like, ala identi.ca, that matches the same API and usability – but can be distributed and federated. This would be possible using XMPP where multiple systems listen to one another via subscriptions and then potentially reroute to their own users they see over this “chatroom”. I have a solution/work-aroubd to this problem… let me make it happen then post my thoughts. This, I think is the result of service providers wanting to get on the gavy train, as Simon said above @Zuola’s tweeting about his arrest today showed the importance of twitter. Exploring identi.ca seems to be the way forward. Also waiting to see Rafiq updates on the same. Oh well….so they apparently didnt have such a good deal with network providers on this. At the end of the day, these people don’t have data connections so the solution is certainly not a technical one. Twitter needs to negotiate with carriers with the point that they are are pre-revenue company with a net positive (very positive) impact on SMS revenues for the carriers, and thus should not pay any SMS fees. The problem is doing this negotiation over and over again with multiple carriers, who may not buy the story of a bunch of American’s pleading how poor they are! and viable should be employed. of one size fits em all, don’t work too good. But that’s just me. They stopped because of the carrier fees. This is just another reason we need to get away from the closed carriers. I know it’s of no use to the wider community, but the latest FrontlineSMS allows users to SMS a message into a central mobile number (ideally local, but it can be anywhere) and for that message to be automatically distributed to a defined group of people. The software allows people to remotely subscribe and un-subscribe from these Groups. An organisation working on a specific project (e.g. election monitoring) could set this up as a temporary solution to keeping others they work with informed. The WordPress iPhone app just jacked up my post when I used it to edit a link… Will fix shortly. In the US carriers provide an email address that will send an SMS to your phone. Is it possible to have twitter’s sent to this email address instead? If not directly in twitter, then a simple XMPP to Email bridge would work. The nice thing about identi.ca is that its open source and one could run the server instance anywhere they wanted to – Rwanda identi.rw – go for it – the bad thing about identi.ca is convincing people to switch from twitter to it. In Japan, where Twitter is the biggest, SMS is obsolete tech (because all phones can send real email). You’re limited to 70 characters (even in English) on my phones, and you can often only SMS to people using your carrier (Docomo, KDDI, Softbank, etc). What I really want? My ability to Twitter via IM back! I honestly wasn’t aware of the implications at all. Great blog by the way. I blog randomly myself at http://www.africanaspects.com – do stop by whenever you have a minute. Cheers. Looking on the positive side the failure or rather non-starter of Twitter in Africa means there is now a bigger opportunity for an African wide eco-blogging service. I hope someone takes the plunge and I dont think we will be waiting too long either. I presented at a conference only two weeks ago and talked about the potential micromessaging technology offered to the African market. In it I discuss laconica, Twitter, and FrontlineSMS. You can see the detailed slides here (http://appfrica.net/blog/archives/205) Yes, now that Twitter is gone it creates a huge opportunity for a similar service local to Africa but it’s a huge blow to Twitter’s potential to serve and already underserved market especially as mobile phone use continues to explode at unprecedented rates across Africa. Well, let’s look at this. Twitter’s scalability has been at issue for some time. If they have to rewrite code and actually build a new application release in order to accommodate even North American users, then that needs to be done. Once the scalability issue is resolved and further expansion potential is built into the application and its infrastructure, then Twitter will be able to serve people no matter where they are. If an alternate application is developed (Is the code THAT hard to write or to build to scalability?) and succeeds in Africa proper (and other countries), then there will be a demonstration of its efficacy and adoption. And, some giant could likely buy both Twitter and the other application. I don’t think it’s doom and gloom at this point. Instead, the Afro/European/Australian/Asian community and beyond will have an alternate communications system and we will have to wait to communicate in kind with these other entities. I don’t think it will take that long, frankly. Hi, folks. This is Evan Williams, co-founder of Twitter. 2) Twitter is still very much global. Approximately 50% of users are in the U.S. The rest are in over 150 other countries (including ones in Africa). 3) We realize that nothing is as ubiquitous as SMS. Our goal is to make Twitter as ubiquitous as possible. We love the idea of supporting every phone in Africa and everywhere else. We’ll continue to work on that. The story is not over. 4) As for the alternatives being discussed: indenti.ca and Jaiku are great — but, as far as I know, neither of them have SMS support at all. It’s not obvious to me how they fill the particular gap Twitter has opened. I’m sure something else will, but they still need to work out the pricing model with the carriers. 5) Re “In our globally connected world, if your service canâ€™t cover the globe, then you need to open it up for communication between similar services.”: We’re big believers in openness. That’s why there are hundreds of services that integrate with Twitter via our well-known API. It is perfectly possible — even easy — today to get messages both into and out of Twitter. If someone were to solve the outbound SMS-issue (and lots of people are trying) in any part of the world and hook into Twitter, we’d embrace that and recommend it. How many subscribers in Africa have data plans? If little, lack of SMS support is a deal-breaker. That’s why identi.ca/jaiku are not substitutes. In fact I don’t understand why people keep talking about technical issues. There is no technical issue, this is purely a deal-making failure. Correction: I’ve been told identi.ca and Jaiku both have some SMS (esp. Jaiku). Not sure where their coverage is. Anyone know? A tool like Identi.ca (or really, the platform it runs on, Laconi.ca) is exactly what the world needs. Microblogging has become the next email, and just as everyone doesn’t have an @aol.com email address, everyone shouldn’t need a handle on Twitter to communicate. Instead, I should be @marina.mydomain and someone else can be @joe.theirdomain. Identi.ca has faux SMS support now – I’m on Verizon and can’t tell the difference between their messages/real SMS, but AT&T iPhone users have had problems. There are SMS gateway providers intersted in stepping up and working with Identi.ca, so it may not be very long at all. Does anyone have stats on which mobile phones are most prevalent in Africa, and how an Identi.ca instance could best serve African users? I’m sure the developer team would like to learn more about this. I’m partially biased, because I run an Identi.ca news blog (Oh, Identi.ca), but only because I’m so enthused by the possibility of the technology/protocol and by the people who are working on it already. I’d love to get some recommendations on how Identi.ca can be serving the needs of Africans. (/me briefly thinks about buying afri.ca…). 1) More support of African languages. We’ve got a number of European and Asian languages in our translation program (see http://laconi.ca/translate/main.php?root=2 ), but not Arabic or other African languages. It’d be good to get the interface translated for them ASAP; seeking native speakers for that project, of course. 2) More SMS presence. We use SMS email gateways to get less expensive SMS broadcasting right now, but we’re looking to expand into “real” SMS sometime this fall or winter (it’s a long process). I’d like to get coverage in a number of countries, and places where SMS is really ubiquitous would be good targets. Especially if we can make it cost-effective. Other things we can do? I think that the advantages of using microblogging in places where mobile phones are ubiquitous and Web access is poor can’t be overstated, and I’d love to see how we can tailor identi.ca to be a useful tool in that kind of framework. freely providing a platform we all want? this is really unfortunate – a team of us are here in Nairobi this week helping community-based sport organizations learn more about how they can leverage technology – we set up the group’s first twitter account . Half of the day was spent discussing mobile alternatives because internet continues to be so limited here. Twitter is an amazing way for these organizations to connect to the rest of the world, but as someone said in an earlier post – if its not mobile, its a deal breaker. As a tech novice myself (I am from the community investment side of Nike) can someone explain to me how the “deal making failure” could be addressed? What is the ask and to whom? @Evan Williams – I’m sure other services, even in Africa, will continue to tap into the extremely open Twitter platform. What’s missing for it to work in Africa is not just the sending of updates, but the receiving of your contacts updates. That really is what created the network effect for Twitter, and why it can’t succeed where it’s not available. In Africa, not having SMS is a deal killer. Though there would undoubtedly be users who access it through the web – as is true throughout the rest of the world, true penetration in Africa can only come through services that can be fully operational using only SMS. Why I think this is particularly disappointing is that those third generation Twitter services that could really serve the needs of both ordinary Africans and humanitarians globally will not be built now. The really interesting thing to me, so that Twitter doesn’t have to shoulder the load by itself, is the opportunity to build services that are separate and independent, but also equal. I guess the closest analogy I have would be to Jabber in this case – where anyone can run a server and that makes the whole greater than the sum of it’s parts. @Evan – I hate to be the bearer of bad news (Not really bad news ;)), but you guys have created something so wonderful that it has become far greater than you. It’s time to let your baby go. Twitter has become an integral part of many peoples lives, and now needs to be hard wired into everything else, and in essence has become a ‘right’ like google search… I have the right to Tweet, just like I have a right to search… I know that sounds crazy. The quandary that is Web 2.0 has left you trying to figure out how to monetize this wonderful tool. Unfortunately, while we wait for you to figure that out, your fan base is fast eroding. Imitators abound, but we all know they’re just that… ‘Imitators’. There is only one real Twitter. My advice – figure out how to ‘Open’ it up before you kill the goose that’s laying the golden eggs. Maybe it’s time for someone in Africa to go ahead and set up their platform. With systems like Laconica already available to use, I can’t imagine it would be too difficult to set up a network. There’s also the option of building a microblogging platform from scratch, just like Domenca did for Slovenia with Koornk. The possibilities are endless. The question is: who will take the first step towards bringing a well-rounded microblogging system to Africa? @HASH You’re right. The growth of Twitter would explode even more if there were some way to run localized servers and just hook it back into the main platform ala jabber. There’s some potential with their API but I don’t see why Twitter can’t federalize and not remain closed sourced software. Hopefully EV comes back to explain. 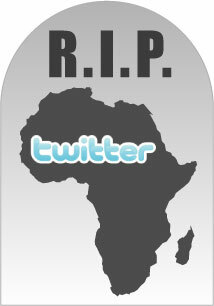 im aggregating african tweets at http://www.twibes.com/group/Afritweets, if you are an Afrocentric twitter user please join up! i do know of many Africans trying to develop something like Twitter with SMS alert capabilities, but end up killing the project, due to the fact that they can afford the high charges for SMS gateways, especially here in countries Cameroon where they still top the list of most expensive phone calls funny right, we have tried to work on some thing like to get to areas in Africa, still looking and hoping that we get to do things like that. @Evans Ebot; Same problem here in Senegal, where Tostan (US NGO) is currently trying to develop a SMS-based Community forum with UNICEF Innovation’s help (rapidSMS). Not financially viable yet… If anyone is interested, please visit http://jokkoinitiative.blogspot.com/ and contact me. Ready to brainstorm. I see great promise with Twitter in Africa. I’m hoping SEACOM and other major fiber-optic plug ins to Africa will increase the number of users with reasonably fast connections and spread the twitter and facebook phenomena even further.